With each passing day, the word automation is growing as the meat of the matter for organizations. And why not? Ultimately, automation saves time and energy of humans by performing monotonous work as per the pre-defined standards. Undoubtedly, automation streamlines business operations and establishes smooth organizational processes. But along with other industries, IT is also leveraging automation to simplify the various technically complex activities. Testing is one of the very crucial parts of Information Technology. The web or mobile application without testing is not considered as a reliable one. Users might encounter with bugs, low system performance, malfunctioning of the features, etc. Eventually, it reduces the client base. So, an accurate and appropriate testing is a primary need to launch a highly efficient system. A variety of automation testing tools is available in the market that enables developers to check out the quality and effectiveness of their web and mobile software or hardware with detailed analysis. Such automated testing software helps developers by saving time and reducing errors occur due to human intervention. 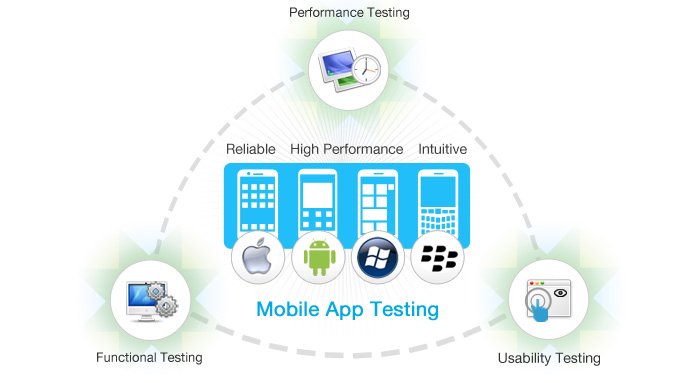 Have a quick overview of the 10 best automated testing tools for mobile apps. An open-source mobile test automation tool to test Android and iOS applications. Developers can test native, mobile web and Hybrid mobile apps on this software. To run the tests, Appium uses WebDriver interface. It supports C#, Java, Ruby, and many other programming languages that belong to WebDriver library. Testers can test native apps that are written in Android and iOS SDKs, mobile web apps that can be accessible through mobile browser, and hybrid apps that contain web view. Being a cross-platform tool, it allows programmers to reuse the source code amongst Android and iOS. Again an open-source tool to test Android applications of all versions and sub-versions. It tests all Android hybrid and native apps. The tests of Robotium are written in Java. Using the tool, it is quite easy to write powerful automatic black box test cases for Android applications. It automates multiple Android activities and creates solid test cases in minimal time. MonkeyRunner is specifically designed for the testing of devices and applications at the framework/functional level. The tool contains amazing features such as multiple device control, regression testing, extensible automation, and functional testing to test Android apps and hardware. The tests of MonkeyRunner are written in Python. Developers need not to make changes in source code to automate the testing. In order to test the user interface of an app, UI Automator creates functional Android UI test cases. It has been recently expanded by Google. The tool seamlessly interacts with all Android software and applications. It works with the all devices that support Android version 4.1 and others that are released after 4.1. In the previous version, testers need to use other testing tools. Additionally, UI Automator can lock and unlock a tablet or a smartphone. Being one of the leading test automation software, Selendroid tests the UI of Androids based hybrid and native applications and mobile web. Client API tests are written using Selendroid 2. The tool supports plugging of hardware devices. Moreover, it holds exceptional capabilities to interact with multiple Android devices at the same time. Selendorid is highly compatible with the JSON wire protocol. MonkeyTalk automates the functional testing of Android and iOS apps. Non-technical person can also run the testing on this platform as it doesn’t require in depth knowledge of techie scripting and programming. The scripts of MonkeyTalk are quite understandable and simple. Testers can also create XML and HTML reports using this tool. Additionally, it also takes screenshots when failure happens. MonkeyTalk supports emulators, network devices, and tethered. It’s a cloud based program for mobile app testing that helps developers in saving development cost, eliminating the unpredictable operational cost, and improving time-to-market. It is one of the best platforms to test your iOS and Android devices that are having different screen resolutions, OS versions, and HW platforms. Testdroid is a tool that reduces the risk with agile and real devices testing. It also improves the daily users of the app along with review rating. Calabash works efficiently with .NET, Ruby, Flex, Java and other programming languages. It tests native and hybrid mobile apps. Programmers can have APIs that enable native apps to run on touch screen devices. Calabash involves libraries that permit test-code to interact with hybrid and native apps programmatically. It also supports the framework Cucumber. Frank allows to test only iOS applications and software. The framework combines JSON and Cucumber. The tool contains an app inspector “Symbioate” that enables developers to have detailed information about the running app. It is most suitable for web based apps and emulators. It can be integrated with CI and run the tests on the devices and simulators. SeeTest Automation is a cross-platform solution. It allows to run the same scripts on different devices. It enables developers to run the test on several devices in parallel. Being a powerful test automation tool, it is capable of testing websites/mobile apps. It supports iOS, Android, Symbian, Blackberry, and Windows Phone. The most important features of this tool are phone testing, battery, browser testing, etc.